Fans of Tarr's historical fantasies will welcome this action-packed sequel to Devil's Bargain (2002). Richard the Lion-Hearted's reign is threatened by the return from the dead of Sinan, the Old Man of the Mountain. 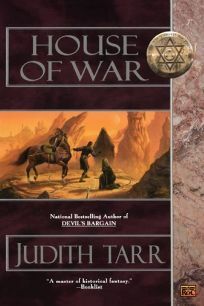 In the Holy Land, it's no-holds-barred and full magic ahead when Richard's half-sister, the druidess Sioned, confronts Sinan. After refusing to give back to Sinan the magical Seal of Solomon, which she stole from Sinan and used to kill him, Sioned steals back from Rome the supernaturally powerful sacred Ark, which the now-returned Jews employ to restore their ancient Temple while taking care not to harm the nearby Muslim Dome of the Rock. Jinns, demons and a host of other supernatural menaces enliven the proceedings.